This book is an indispensable guide to navigating the complex maze of nonprofit tax rules and regulations. A clear and fully cited description of the requirements for the various categories of tax-exempt entities from public charities, private foundations, civic associations, business leagues, and social clubs to title-holding companies and governmental entities can be found. Practical guidance on potential for income tax on revenue-producing enterprises along with explanations of many exceptions to taxability is provided. Issues raised by Internet activity, advertising, publishing, providing services, and much more are explained. This useful guide covers the many significant issues facing nonprofit organizations, including compensation and possible private inurement, affiliation, separations and mergers, donor disclosures, lobbying and electioneering, and employment taxes. 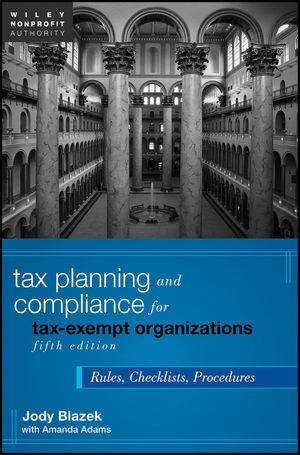 Filled with practical tips and suggestions for handling such critical situations as preparing for and surviving an IRS examination, Tax Planning and Compliance for Tax-Exempt Organizations, Fifth Edition provides guidance for the significant issues facing nonprofit organizations. Jody Blazek is a partner in Blazek & Vetterling, a CPA firm focusing on tax and financial planning for exempt organizations and the individuals who create, fund, and work with them. She is the author of six books in the Wiley Nonprofit Series and served on the Panel on the Nonprofit Sector's Transparency and Financial Accountability Work Group. She is former chair and a member of Form 1023 and 990 Revision Task Forces for the American Institute of Certified Public Accountants (AICPA). Amanda Adams is a partner in Blazek & Vetterling. She has coauthored (with Jody Blazek) Revised Form 990: A Line-by-Line Preparation Guide (Wiley). She is an associate member of the AICPA's Exempt Organizations Tax Technical Resource Panel. She has a wealth of knowledge about the impact of partnerships, hedge funds, and other alternative investments owned by nonprofits, private foundations, and supporting organizations.